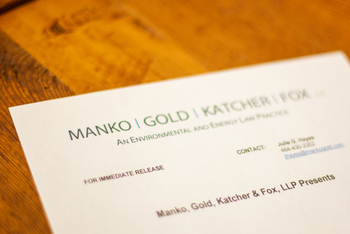 Philadelphia, PA (July 20, 2009) – Bruce S. Katcher, a founding partner of Manko, Gold, Katcher & Fox, LLP (MGKF), an environmental and energy law firm, will present a seminar on New Jersey's New Site Remediation Reform Act on Wednesday, August 5 at the Builders League of South Jersey in Cherry Hill, NJ. Katcher will provide insight on how the new Site Remediation Reform Act (SRRA), which authorizes private licensed site remediation professionals (LSRPs) to oversee cleanups in lieu of the New Jersey Department of Environmental Protection (NJDEP), will affect performance of cleanups in New Jersey. While this new process offers the promise of expediting the cleanup process, it also creates new obligations and challenges. Currently, the NJDEP is in the process of developing the program guidelines, and this seminar will offer the most up-to-date information available on how the LSRP program will work.